Agricultural robots are becoming more advanced. 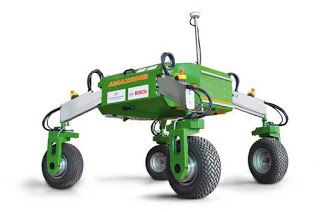 An agricultural robot or agribot is a robot deployed for agricultural purposes. These robots were once just capable of collecting crop and soils samples but are now able to navigate equipment through GPS eliminated the need for a driver. Agricultural Robotics is the logical proliferation of automation technology into biosystems such as agriculture, forestry, fisheries, etc. Robots have the advantage of being small, light weight and autonomous. Because of their size they can collect data in close proximity to the crop and soil. At the other end of the size spectrum, University of Illinois agricultural engineers are working on robots ("ag robots") small enough to walk in the rows between plants, scouting for weeds and insects, and taking soil tests. These small (approximately one foot long) robots could do the work now tediously done with human-piloted tractors. 0 Response to "Agricultural Robots"